Kiss My Face sunscreens are Earth-friendly, and they also contain natural ingredients. Because the skin can absorb up to 60 percent of what we put on it, Kiss My face takes great care to use ingredients that cause no harm when absorbed by the skin. Not only are Kiss My Face sunscreens natural and environmentally-friendly, they also work outstandingly well. The brand makes some options for active people to resist water and sweat while surfing, swimming or just enjoying the great outdoors. For nourishing skincare and SPF 18 sun protection in one, try Kiss My Face's Oat Protein Sunscreen. The lotion contains Beta Glucans and oat protein to moisturize the skin and prevent aging. The Beta Glucan also reduces skin irritation and inflammation, so it can soothe any preexisting sunburn you may have. Natural titanium dioxide minerals block the sun's harsh rays and prevent burns without toxic chemicals. The Kiss My Face Oat Protein SPF 18 is available in 4-ounce and 1-ounce bottles, so you can purchase it in a travel-friendly size if needed. The Oat Protein Sunscreen is water-resistant and free of parabens and artificial fragrances. If you seek an easy-to-apply sunscreen with a little bit higher SPF, Kiss My Face Sunspray Lotion SPF 30 is a convenient solution. 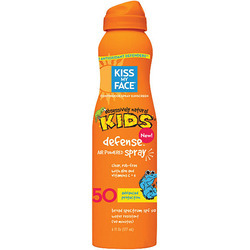 The spray bottle application makes it quick and easy to apply the sunscreen evenly all over, and it is also very handy for kids. It contains soothing aloe vera, which can calm existing sunburn or bug bites, and is perfect for active people because of its water-resistance. Without any artificial dyes or fragrances, this spray sunscreen is good for people with sensitive skin. 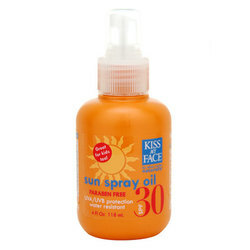 Kiss My Face also makes an SPF 30 Face Factor Sunscreen in regular bottled lotion form. It contains Alpha Lipoic Acid and Green Tea Extract to protect the skin against sun damage. Aloe vera soothes any existing skin irritation and improves skin hydration. This sunscreen also comes with Zoe™, which is a patented linoleic acid that decreases skin sensitivity. 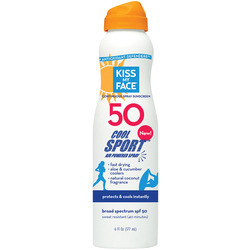 SPF 30 Face Factor Sunscreen also has a water-resistant formulation, perfect for active wearers. Like most other Kiss My Face products, this sunscreen has no irritating artificial fragrances or dyes to upset your skin. Its sun protection and moisturizing ingredients prevent aging and keep your face comfortable in the sun. Besides using natural, health-friendly ingredients, Kiss My Face also avoids animal testing. The brand's high ethical standards make it a company you can feel good about purchasing from. It uses sustainable and plant-based ingredients that do not harm the environment. Extensive scientific research on natural plant ingredients, vitamins and oils has gone into the product formulation to ensure effectiveness and safety. Its packaging uses as much post-consumer recycled material as possible, reducing waste while creating new products. They are affordable and an excellent deal for the quality.